This should be one of the last things that you read, and one of the first things I that I have written. You should be estimating based on the more physical items, like Adding an Output Screen. I should treat this as a template for how to add various objects. Unfortunately, there may be a time when an estimator is trying to estimate an application where none of the elementary processes seem to fit the ones that have been presented in this methodology. This process can be evaluated using this approach. Alternately, this can act as a template to build some other estimating templates that will be more useful to estimate applications similar to the one with the unrecognizable processes. It is performed by a single person or process. The process might be another application. In the example above, the author is the single person. Now, you might wonder what happens if the post takes multiple sessions of editing? You might have to adjust the user stories to reflect that posts can be added or changed, and that they may be saved as drafts or published. Thus, we might end up with a half dozen user stories and elementary processes. In an elementary process, the user is not always human. Some people write their blog posts using Evernote. In synchronizing between WordPress and Evernote, Evernote is a user. It is completed at one time. This is why the posting a blog story is not an elementary process. One of my professors used to say there was no such thing as writing, only rewriting. In any case, an elementary process should be completed at one time. If you have epic stories, they must be broken up into their component elementary processes. It is preformed at one location. Given the laws of physics, if something is completed at one time, it is probably performed at one location. A process that began when a package was picked up at one address and ended when it was delivered at another location would have to be more than a single elementary process. It responds to an event. Normally, an elementary process is a response to a business event. For example, if you receive a check, you must enter it into the system as part of the deposit process. Scheduled events can fall into this category. For example, sending a statement to customers at the end of the month is an elementary process. It leaves the data in a consistent state. An obvious example is changing an address. If you change the city without changing the state, then the address is in an inconsistent state. Therefore changing the city is not an elementary process. Changing the address might be. Changing profile information usually is. There are other cases that must be considered. For example, is adding a dependent on an employee record an elementary process, or is it part of the elementary process of changing employee information. It is probably the latter, since having no or incorrect dependent information leaves the employee data in an inconsistent state. 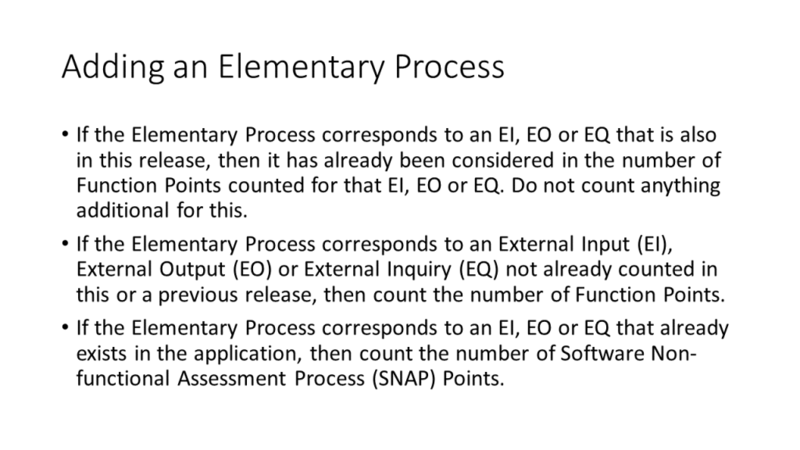 Elementary processes often become function point transactions: External Inputs (EIs), External Outputs (EOs) or External Inquiries (EQs). Every transaction must cross the application boundary. If its primary intent is to put information into the application, then it is a EI. 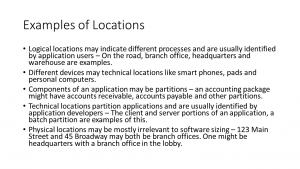 Transactions that send information beyond the application boundary are either EOs or EQs. The differences between EOs and EQs will be described below. Elementary processes do not always become separate function point transactions. For example, suppose you had an application where one elementary process was to produce a printed report and another was to fax the same report. They would become part of the same EO or EQ. This is because they would be displaying the same DETs and accessing the same logical files to generate both versions of the report. If you were developing both elementary processes for the same release, you would probably have the same developer or developer pair working on both. It would not take much more time to deliver both, than delivering one. If neither version of the report had been developed, and only the printed version was being developed for the next release, then the size of the report should be calculated using function points. That procedure is described below. If the printed report had been developed for a previous release, the fax version should not take as long as developing it from scratch. This would be true even if we were simultaneously changing the printed version. In either case, use SNAP points to count this new version as a change to the printed version. This process is described in a separate post, Changing an Elementary Process. Roberto Meli found that once it had been decided that an elementary process was a function point process, i.e. an EI EO or EQ, then its most likely size was 4.4 function points. It may seem that if you have no idea whether you are estimating an input or an output, then you do not know enough about the application to do any estimating at all. That is not completely true. There have been cases where the development team must build an application program interface (API). You may see methods with names like SendSomeObject. You might not be sure whether the application that you are estimating is sending the object, or whether the application your application is interfacing with is sending the object. You might be able to find out, but is that the best use of your time at the point when you are making this particular estimate. 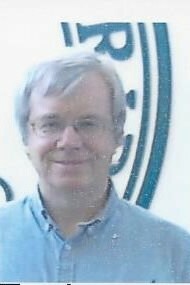 Roberto Meil has found that the most likely size of an EI is 4.2 function points. Another possible way to size an EI is by checking the user story for any keywords in the list below. 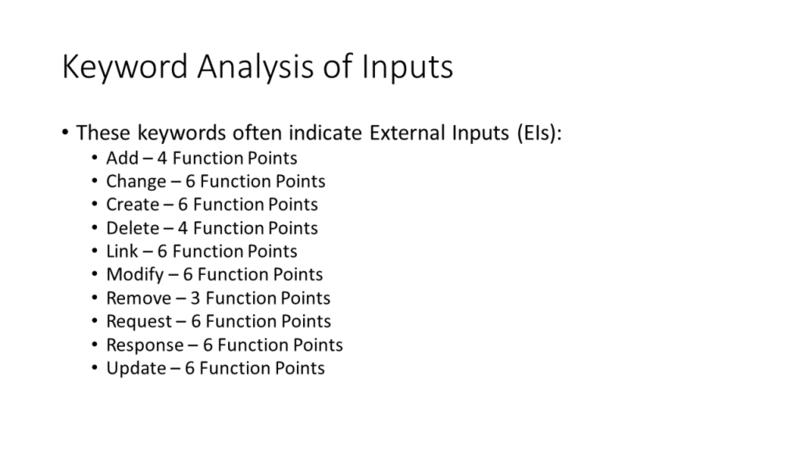 When a user story contains one of these keywords, there is a good chance that it is an EI with the indicated number of function points in size. Use this as your estimate unless you have reason to believe otherwise. The number of function points for an EI can be derived based upon the number of File Types Referenced (FTRs) and Data Element Types (DETs). FTRs is the number of logical files that are being accessed in order to display the output. It also includes any files that are written to but not read from. Part of the estimating process is to maintain a list of these logical files. DETs are basically the fields that are transferred across the application boundary by the elementary process. There is one extra field called the action code. Even if it is not visible, it is assumed to be there. Thus, there is always at least 1 DET on an output screen. There is also a DET if the elementary process might generate an error message. For example, if there were a selection field to return posts that met some type of criteria, like a date range and the user entered an invalid date, then an error message would be generated. This would be counted as a DET. If the screen generated error messages for invalid dates, invalid amounts and other invalid input, the error messages would still be considered a single DET. Each of the fields crossing the application boundary are possible DETs. They must be unique. In other words, if the same field is occurs twice, it is only counted once. Likewise, if a set of fields are transferred for each of 12 months, it is only counted as a single DET. 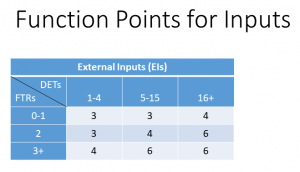 EI are between 3 and 6 function points. The matrix below shows the how the function points are assigned. Note that the diagonal from the lower left to the upper right have the same values and they correspond to an average EI. The cells on the upper left correspond to lower sized transactions, while those on the lower right correspond to higher size. It is important for estimators not to become obsessed with exact numbers for DETs and FTRs. First, it does not matter whether your DET count is any number between 5 and 15, your estimate will come out the same. When you have a FTR of 1, any DET count less than or equal to 15 will yield the same number of function points. If you are estimating schedule and effort, you are going to look at many transactions. You will then have to estimate the values for over a dozen cost drivers. If you a a product owner, you will also have to identify the most important stories to implement in the next iteration. You will be involved in other activities such as communicating with the user community. You just do not have time to obsess over DET and FTR values. Guess a little! An output function point transaction might correspond to either an External Inquiry (EQ) or an External Output (EO). Roberto Meli has analyzed a corpus of function point counts and determined that the most likely function point size associated with an output (when it has not been determined whether it is an EQ or an EO) is 4.6 function points. This could be used as an estimate. 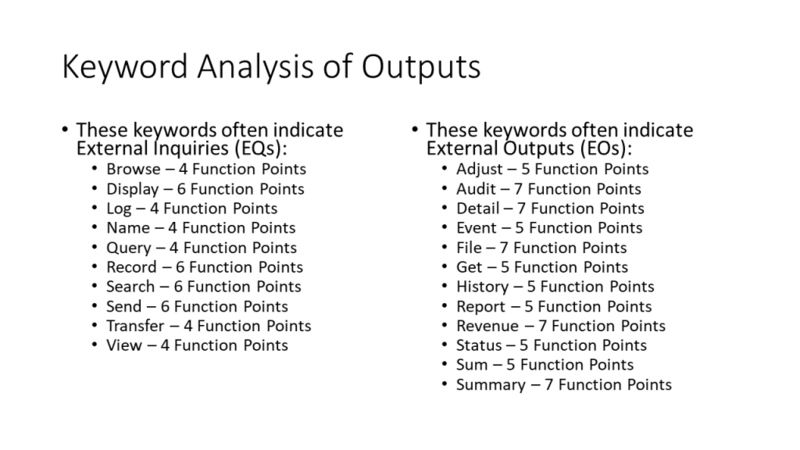 A different corpus of function point counts was subject to keyword analysis. The following slide shows the result for output transactions. When a user story contains one of these keywords, there is a good chance that it is an EQ or an EO that is the indicated number of function points in size. Use this as your estimate unless you have reason to believe otherwise. The definitions of EQs and EOs can be used as a clue as to which type of output transaction this is. If the transaction reads from the logical files being maintained by the application and outputs some of their content, then the transaction is an External Inquiry (EQ), unless there is a complication. If there is a complication, like the transaction requires calculations or writes information to a logical file, then it is an External Output (EO). Roberto Meli has found that the most likely size of an EQ is 3.9 function points; for an EO it is 5.2. The number of function points for an output can be derived based upon the number of File Types Referenced (FTRs) and Data Element Types (DETs). Counting FTRs and DETs was described in “Sizing Based on File Types Referenced (FTRs) and Data Element Types (DETs),” above. EQ transactions are between 3 and 6 function points; EOs are between 4 and 7. The matrices below show the how the function points are assigned. Note that the diagonal from the lower left to the upper right have the same values and they correspond to an average output. The cells on the upper left correspond to lower sized transactions, while those on the lower right correspond to higher size. The EO is 1 function point higher in each cell. The same comments regarding counting FTRs and DETs apply here as were described above. It is seldom worthwhile to agonize over a DET or two. When adding an elementary process, the exact number of FTRs and DETs may not be known. When you take guesses, the errors will tend to cancel out. You will sometimes guess too high, but on another transaction you will guess too low. This is true of random errors. If you are are making systemic errors, the result will be a poor estimate. For example, if you always choose the highest value it could possibly be, then you estimate will end up too high. Make your best estimate and move on to the other tasks that must be performed. Many applications display information on screens. The example above is the WordPress screen that shows the posts that make up the blog. If we were developing the WordPress application, then adding this screen would probably be in the first release. It might be changed in future releases. The initial user story for this might be: “As an editor, I can see a list of posts that make up the site.” Details of the listing may be supplied through conversations with the users. It is possible that there will be another initial user story that says, “As an administrator, I can see a list of posts that make up the site.” This is where a decision must be made. Will the same list be available to both editors and administrators, or will the each category of user require different information in their lists. If they are basically the same, then there is only one screen to estimate. If they are significantly different, then each screen should be estimated separately. Of course, words like “basically” and “significantly” are weasel words. (The word “significance” means something to a statistician, but for most of us, it is a weasel word.) Here is one of the many places where an estimator must use his or her judgement. When two screens are 90% the same, they are the same. There are times to be more liberal. 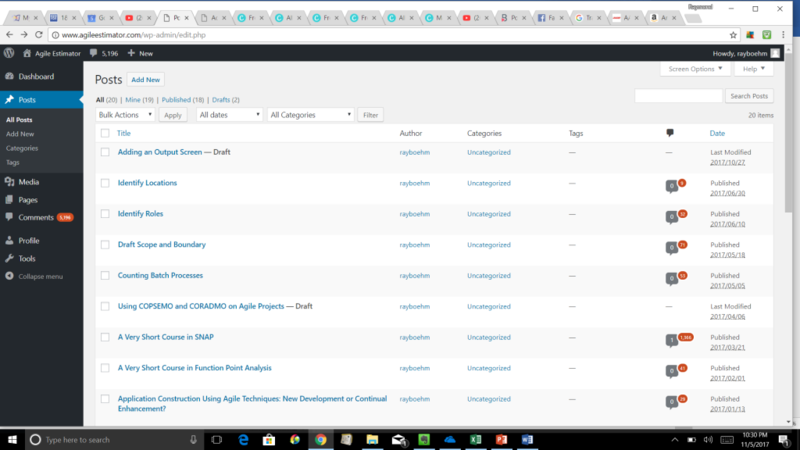 For example, suppose there was a user story that says, “As an author, I can see a list of my posts on the site.” The output looks just like the one above, except that there is no author column. Why should there be? It would only consist of the name of the author requesting the list. Probably, a developer would write one report and have logic to omit the author’s name when it was an author requesting the report. In any case, as an estimator, I would probably consider it to be the same as the other versions of the post list. We have another example of this in the screen above. The same report can be generated for all posts, only my posts, only published post or draft posts. I would consider all of these the same post listing and only estimate one. However, there is a way to perform a search for certain post reports. This search looks right into the posts and can find all of the posts that have a string like “SCRUM Master” somewhere in the post. This is different enough that it should be estimated separately. On the left side of the screen is a menu. Many applications have their menus at the top of the screen. In any case, the menus are not estimated separately. A user needs to be able to see the list of posts. Something must trigger this listing to be generated. That is essentially part of the output screen. It is not estimated separately. This is consistent with the way that user stories are usually written. We would not expect to see a story like “As an editor, I must click on a menu item to generate a list of posts that make up the site” in addition to the stories already mentioned. Once you have decided that there is a single output screen, that screen might correspond to either an External Inquiry (EQ) or an External Output (EO). It would be impossible to make that determination based on the user stories that were shown above. There are a few ways to proceed. Roberto Meli has analyzed a corpus of function point counts and determined that the most likely function point size associated with an output (when it has not been determined whether it is an EQ or an EO) is 4.6 function points. This could be used as an estimate. The definitions of EQs and EOs can be used as a clue as to which type of output screen this is. If the screen reads from the logical files being maintained by the application and displays some of their content, then the screen is an External Inquiry (EQ), unless there is a complication. If there is a complication, like the screen requires calculations or writes information to a logical file, then it is an External Output (EO). The WordPress screen above is obviously an EO. Roberto Meli has found that the most likely size of an EQ is 3.9 function points; for an EO it is 5.2. The number of function points for an output can be derived based upon the number of File Types Referenced (FTRs) and Data Element Types (DETs). FTRs is the number of logical files that are being accessed in order to display the output. It also includes any files that are written to but not read from. Part of the estimating process is to maintain a list of these logical files. Looking at the screen above, it is probable that there are two FTRs, one for posts and one for comments. DETs are basically the fields that are displayed on the screen. There is one extra field called the action code. Even if it is not visible, it is assumed to be there. Thus, there is always at least 1 DET on an output screen. There is also a DET if the screen might generate an error message. For example, if there were a selection field to return posts that met some type of criteria, like a date range. If the user entered an invalid date, then an error message would be generated. This would be counted as a DET. If the screen generated error messages for invalid dates, invalid amounts and other invalid input, the error messages would still be considered a single DET. Each of the fields displayed on the output screen, as well as any selection criteria fields, are possible DETs. They must be unique. In other words, if the same field is displayed twice, it is only counted once. In the above screen, you can select your posts based on their category. The category is then in the display. Categories is a single DET. The same is not true of Dates and Date. The selection criteria is a month, while the actual date is displayed. These are 2 DETs. Likewise, if a set of fields are displayed for each of 12 months, it is only counted as a single DET. We have a judgement call in the above screen. There are two values for number of comments: one for number of moderated comments and one for accepted comments. I would call this 2 DETs, but someone might argue that they are both the same data type and therefore one DET. Be careful of too much consolidating or there might only be a few DETs: one for numbers, one for character strings and one for dates. This is clearly too much consolidation and would lead to bad estimates. Based on these rules, the above screen has 10 DETs: action code, dates, categories (both in selection criteria and in the results), title, author, tags, moderated comments, approved comments, date and the total number of posts displayed (21 in the illustration). The page numbers and logic involved in pagination are not counted. EQ screens are between 3 and 6 function points; EOs are between 4 and 7. The matrices below show the how the function points are assigned. Note that the diagonal from the lower left to the upper right have the same values and they correspond to an average output. The cells on the upper left correspond to lower sized transactions, while those on the lower right correspond to higher size. The EO is 1 function point higher in each cell. In our example screen above, an EO with 2 FTRs and 10 DETs would have a function point size of 5. Remember that Roberto Meli would have estimated 4.6 function points without even deciding whether this was an EQ or an EO. Once that was decided, the estimate would have been 5.2 without counting FTRs or DETs. It is important for estimators not to become obsessed with exact numbers for DETs and FTRs. First, it does not matter whether your DET count is any number between 6 and 19, your estimate will come out the same. In our discussion above, we questioned whether our DET count should have been 9 or 10. Either decision would yield the same estimate. When you have a FTR of 1, any DET count less than or equal to 19 will yield the same number of function points. If you are estimating schedule and effort, you are going to look at many transactions. You will then have to estimate the values for over a dozen cost drivers. If you a a product owner, you will also have to identify the most important stories to implement in the next iteration. You will be involved in other activities such as communicating with the user community. You just do not have time to obsess over DET and FTR values. Guess a little! This shows how the above screen would have been estimated. But how does this compare to the original user story, “As an editor, I can see a list of posts that make up the site.” A user story like this would be an EQ only require 1 FTR and 2 DETs. The EQ matrix indicates that this would be 3 function points. There might be another user story that said, “As an editor, I can see how many comments were made on each post.” That would basically be the screen above that we just estimated as 5 function points. Put them together we have 8 function points. However, the 5 function point screen also delivers the functionality of the 3 function point one. A product owner could use this information to just have the 5 function point screen implemented. This would save time and money. Some estimators are like weather forecasters. They predict what is likely to happen but take no actions to change the future. A product owner can use knowledge of the application along with estimating skills to lower the size, and therefore the cost, of a release. Thus, the product owner is functioning as a member of the team. From the very beginning, all participants should start to form some expectation regarding the size of the application to be estimated. At the top of the post is the size distribution of new development projects. The size distribution is expressed in IFPUG function points. The methodology presented here uses IFPUG sizing measures. At this point, there is not enough industry experience to present a similar distribution for SNAP points. Even if there was, function points would still be the best way to express the size of an application that is about to be built. SNAP points become more important when estimating the schedule and effort for projects that have changes in functionality, such as enhancement projects. In any case, The sizing methodology presented here will take into account both function points and SNAP points. 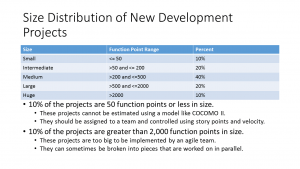 if an applications is 50 function points or less, it should simply be assigned to an agile team and they should handle any estimating and reporting. The initial team size should be based on management’s experience with similar applications. Team size can be adjusted in future iterations. At the other extreme, only 10% of the projects studied had function point counts that exceeded 2,000. There is simply not enough experience with these larger applications to proceed without extra caution. 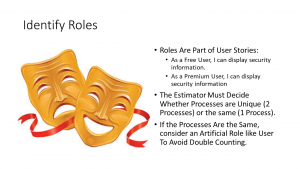 When an estimator is convinced that a project is more than 2,000 function points in size, the possibility of dividing the project into separate components should be considered. Otherwise, the process can still be used, but additional care must be taken to insure functionality is not being missed. These huge projects can almost never be done by a single agile team. According to industry practice, establishing scope and boundary is a must for any estimating exercise. Since this process is basically function/SNAP point based, it made sense to use the standard IFPUG definitions for these attributes. Scope and boundary rules are basically the same for both function points and SNAP points. The first step it to draft the scope and boundary of the application to be estimated. The scope and boundary may change during the estimating process. This may be the result of better understanding of the project or a change in scope. When this happens, the estimating process has to be reworked. Prior to defining the scope and boundary, the purpose and type of assessment must be determined. This process was developed with a certain purpose and type in mind. The purpose of any assessment is to estimate the size of an application to be developed so that the size can be fed into an estimating model. The size will include both functional and non-functional requirements. All agile application development efforts involve taking some software and converting it into some other software with additional or changed capabilities. This type of assessment is an enhancement project. New development can be treated as a special case of enhancement. In new development, there is no existing capability to begin with. In days of old, the waterfall methodologies favored this special case of new development. You began with nothing and continually transformed models until you ended up with a completed application. For example, you did analysis and ended up with a data flow diagram of the entire system to be built. Then you transformed that into a structure chart to show all the components to be built. Then you coded the design to have a system. That was classic new development. In agile development, you are continually transforming working software from one form into another. A simple release is built that contains a workable subset of requirements. Then, the attributes of that release are changed and augmented to produce the next release of the software. It is basically software development by continual enhancement. Fortunately, this approach also works if the team is tasked with enhancing an existing piece of software that they did not build. According to the IFPUG Counting Practices Manual (CPM), the scope “defines a subset of the software being sized.” It identifies which functions will be included in the size so as to provide the best estimate. A project might only be enhancing certain portions of a system. There may be reusable components that will supply some of the functionality to be delivered. All of this must be considered in the scope. For people using the IFPUG sizing methodologies, sizing can be complicated. For people using the process outlined here, it is fairly straight forward. The scope includes any existing software attributes that will be changed and any new attributes that will be added. People familiar with IFPUG methodologies may ask about deleted attributes. Most estimating models ignore deleted attributes. They are ignored here. The CPM states that the boundary “defines what is external to the application.” If the application being built must interact with other applications, then these applications are outside of the boundary of the one being developed. People who use the application are outside the boundary of the application. The bad news is that establishing boundaries can be complicated. For example, is there a boundary around Microsoft Office? Or, is the boundary around Excel, Word , PowerPoint, etc.? How about QuickBooks? It seems like there should be a single boundary around QuickBooks. However, there are several versions of QuickBooks. There are several for the PC that have extended functionality. There is one for the Mac. There is a version that only works on the web. Some of them probably share portions of each other’s code. Where does the boundary get drawn? Fortunately, there are two pieces of good news. The first is that when using this process, the boundary is usually drawn around the attributes of the application that will be changed and includes the things that will be added. Sometimes, there will be changes made to multiple applications. In that case a boundary will be drawn around each. Who decides and how do they do it. This is the second piece of good news. It is the users, and probably the product owner, that is most qualified to make this determination. They make it by deciding how users view the software they are using. For example, do they think they are using Microsoft Office or Microsoft Excel? It is probably the latter and that will drive their boundary decisions. The scope and boundary may emerge from a study of the initial stories that define an application. Otherwise, they must be established by some other collaboration between the estimator(s) and the stake holder(s) of the application. The definitions of scope and boundary for this process are completely consistent with those found it the IFPUG CPM. Of course, these definitions of scope and boundary are probably generic enough to be used with virtually any sizing measure. People who are familiar with the SNAP process may be surprised that no mention has been made of partitions. Partitions are identified as part of this process. However, they are not identified at this time.